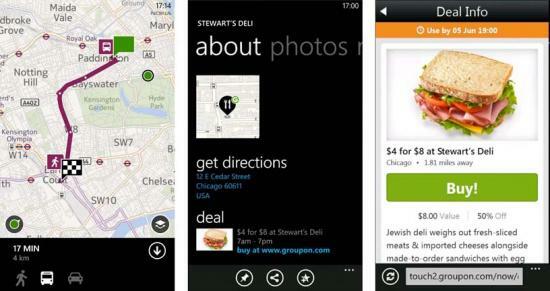 Nokia Maps for Windows Phone running Nokia Lumia smartphones has received an update and its version has now reached to v2.5. With this update a few new features have been added to the app which includes Groupon addition, pinning a route to start screen, and more. Pin a route to your Nokia Lumia start screen or share the route with your friends on Facebook, Twitter or LinkedIn. Sync your routes across your Lumia smartphone and the web (maps.nokia.com). Your favorite destinations are always close by no matter where you sign in. Explore Nearby feature shows you the top 25 places around you with one tap (based on user reviews, trusted guides and local providers). So head over to the Windows Marketplace and download the update for your smartphones.